Remove two screws “A” holding single curved door stop to inner face of door. See Figure No. 11. Remove three screws “B” holding hinge to inner face of door. To install, reverse this operation. For in and out adjustment at top of door, loosen the two doo r lock striker screws at upper opening. 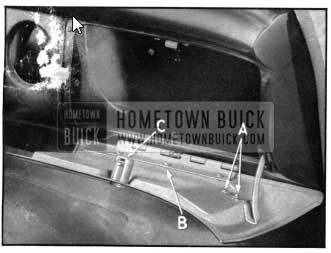 For in and out adjustment at bottom of door, loosen the three screws holding door hinge to flange of 1950 Buick instrument panel. For up and down adjustment, loosen the three screws holding door hinge to the inner door panel at bottom of door. For adjustment and alignment of the curved door stop, loosen the screws attaching door stop to door inner panel. The lock is released by removing one screw and washer on the lock retainer cap, shown at “C” Figure No. 11. Open 1950 Buick instrument panel compartment door and re­ move all screws (6) holding box to 1950 Buick instrument panel. Note respective positions of different type screws before removing. The striker plate at top of opening need not be removed in this operation. See Figure No. 11. Note: The windshield belt molding is made in two sections. The right hand section overlaps the left hand section. This operation explains removal of only one section. Underneath instrument panel, remove the two (2) nuts and washers from windshield inner lower frame portion of the defroster duct (See Figure No. 12). Also remove the single nut and washer retaining both overlapping molding sections under center division . From outside of body, remove belt molding. To install, reverse this procedure. 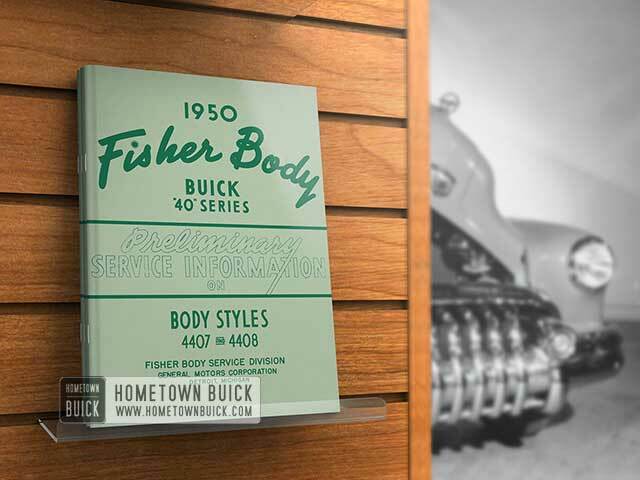 Prior to in­ stalling , apply “3M Autobody Sealer” around all attaching screw holes in body panel. Under 1950 Buick instrument panel remove belt molding retaining nut and washer at center of body below windshield division bar. 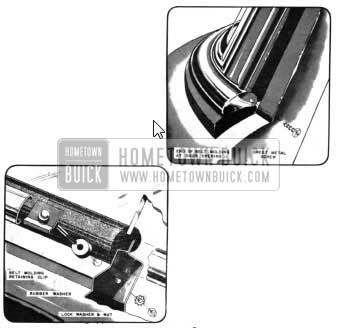 From inside body at windshield inner division molding, remove the three (3) barrel nuts retaining inner and outer division moldings. From outside body remove outer division molding.